The riot that took place on July 18, 1964 was inspired by a tragic event that had taken place only two days before. It was a hot summer day in the predominantly white neighborhood around East 70th Street, when a superintendent of one of the buildings pointed his hose in the direction of a few misbehaving African-American teenagers. The young boys were loitering around the same building that the superintendent was working. After refusing to move away from the area, one of the boys, fifteen year old James Powell chased the superintendent into the apartment. An officer who was patrolling nearby overheard the ruckus that they were making and approached the scene. The officer was in fact an NYPD Lieutenant by the name of Thomas Gilligan, who was also 16 year war veteran. Soon, James Powell and Thomas Gilligan came into a direct confrontation. James Powell who was wielding a knife attacked Gilligan, slashing him on the forearm. At this point Thomas fired his revolver, killing the teenager. After the incident many in the black community of Harlem, were seething with anger and outrage at the murder of a young boy. They wondered how Thomas Gilligan, a lieutenant and veteran could not resolve the conflict without killing Powell. After two days of uneasiness and mourning, on the night of James Powell's funeral, a crowd of angry people gathered around Reverend Nelson Duke. He enticed them with his speech to march to the police precinct and demand justice for the crime committed. The precinct was located on West 123rd Street in the center of Harlem. As the crowd arrived in front of the building they faced a police force that was already stationed there. The senior officer tried to pacify the crowd explaining that the event was being investigated by the district attorney. However, they were not satisfied with this answer and did not disburse. Some rioters on the roof top began to throw bottles and bricks at the police below. The Tactical Patrol Force was ordered to disperse them, and with their batons in hand they lunged towards the crowd. At one point the officers fired 2000 gun shots into the air to disperse the crowd. However, this further enraged the rioters and mobs that were fighting the police. Some of the rioters threw Molotov cocktails at them. The riot, which lasted 6 days after the initial confrontation, was violent and bloody. Each day police officers, having lost patience and restraint, began firing their guns without warning at rioters. On July 22, in a second major confrontation throughout the six day rampage, over 1000 rioters clashed against a highly trained Tactical Patrol Force. Only one person died in the violence that took place, but many were injured. Throughout his trial, Thomas Gilligan maintained that Powell was wielding a knife. The district attorney ruled that he was not guilty and all charges against Gilligan were dropped. 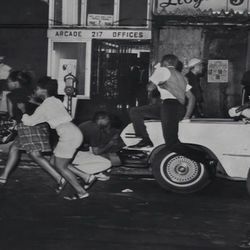 With extreme poverty and discrimination fueling their anger, the 1964 race riot was just one among many that would take place in the coming decades in American cities.